I am about to say it….. It is time for the C word. How ready are you for Christmas? I wasn’t but on my child free Tuesday I was like super woman. I shopped until I dropped! I left school at 8:40 and arrived back at 2:50 and I hadn’t stopped. Even worse than that I had only had one coffee in all that time! It was an extra large latte from Muffin Break, but it was still only one coffee! But I am now organised(ish). I know a whole day shopping sounds terrible, doesn’t it 😉 but it was exhausting! Now I mean I am organised with presents! Food is another matter. Although this year we are sharing Christmas with our lovely neighbours so I only have to worry about potatoes. I need to make a few potato dishes for 28 people! Stay tuned for the potato marathon! 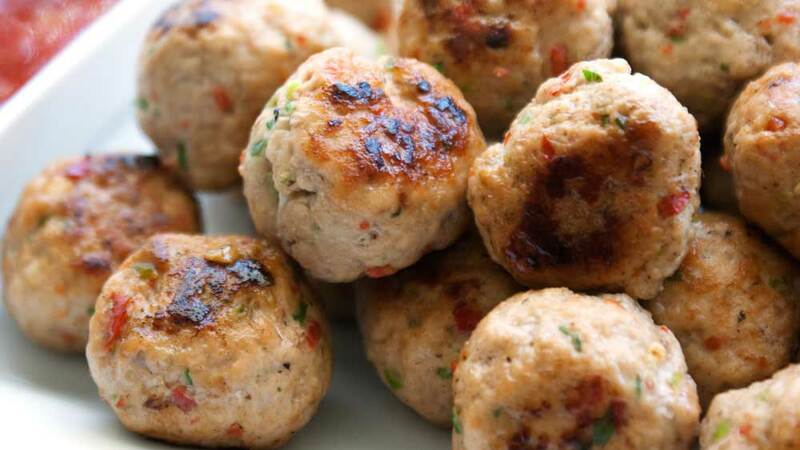 What I’m posting today is a great recipe, as these little chicken meatballs are packed with flavour and can be enjoyed as canapés with a sweet chilli dipping sauce, or served with egg fried rice as a great main meal. These tasty morsels have been a favourite of mine for years, since I first bought, read, re-read and cooked the entirety of Nigel Slater’s book Appetite. In that he has a recipe for pork meatballs. They are the more traditional meatballs that I ate as a child. Onion and a few herbs. But he gave variations and alternative ingredients and it was there that I first found his spicy pork patties. Filled with lemongrass and chilli, they were amazing, I used to cook up a massive batch, freeze them and then take them with a noodle salad for my lunch. Yum! 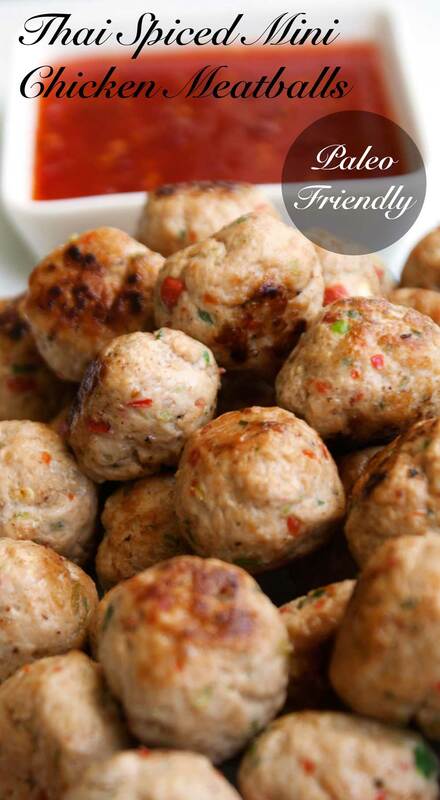 These chicken meatballs ones are my version, they are packed with wonderful Thai flavours. Garlic, ginger, chilli and coriander. Totally scrumptious. Sometimes I will add a grated carrot, it adds a sweetness and boosts your veggie count. I didn’t yesterday. I made these as pure meat filled yumminess. These aren’t light fluffy meatballs, they are a little denser than that due to the lack of bread in them. I rather like them for that, they feel more like you can eat them without sauce. It also has the advantage of making these gluten free and paleo friendly so you can serve them happy in the knowledge that everyone, other than your vegetarian friends, can eat these! 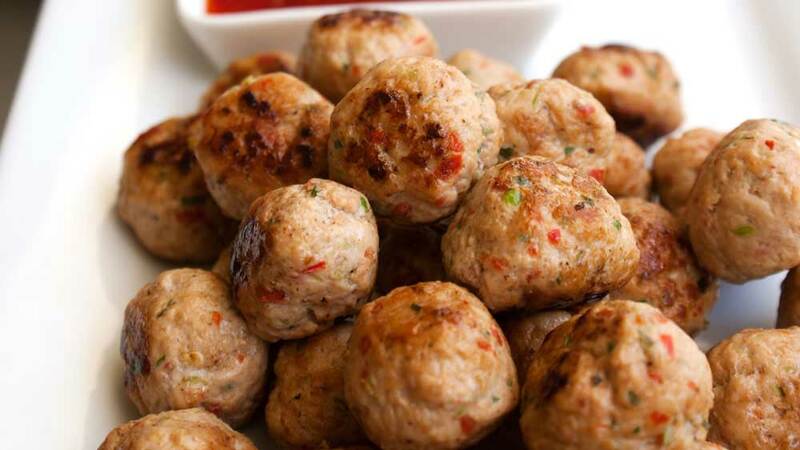 That’s right………Gluten free chicken meatballs! 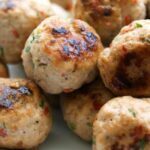 Paleo chicken meatballs! Yummy scrummy chicken meatballs!! These always get demolished, they are very moorish! Put them on the table whilst you have friends over and see them vanish. Or serve them up in a bowl whilst you are watching a movie and before you know it, you’ll reach in and find there are none left. They also freeze well, you can either freeze them before you cook them, or fry up a batch and put them in the freezer when they have cooled. 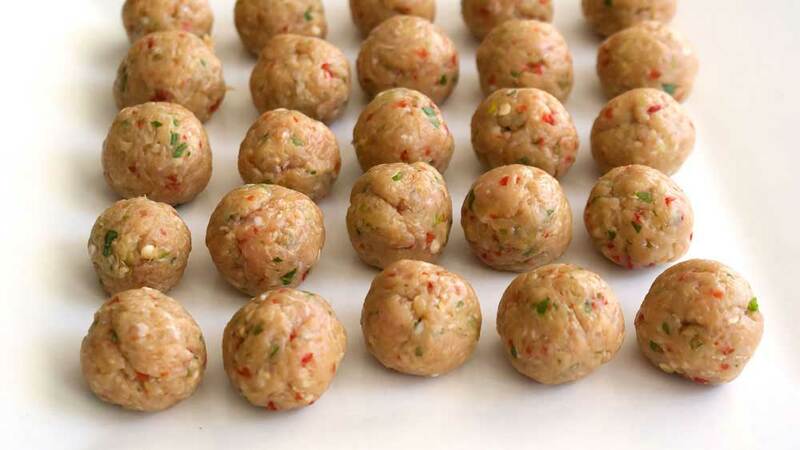 I place them on a baking sheet and then put it into the freezer for 3 hours until the meatballs are hard. Then you can transfer them to a tupperware or ziplock bag. If you freeze them cooked, you can defrost them and eat them cold, or heat them briefly in the microwave or oven or even poach them in a pan of simmering stock/salted water (It should be salted as when you poach them they will leech out some salt, adding salt to the water helps to prevents this). Freezing them uncooked, I would defrost them in the fridge overnight (you probably could use the microwave but I never have much success defrosting in the microwave. I always end up slightly cooking my food) and then cook as per the instructions. Seriously try these, perhaps this Christmas???? They are a great dish to serve with drinks, plus you can make them next week and have them stashed in the freezer ready for Christmas. In fact if you have a few cooked bags stashed away you are 10 minutes away from serving a great canapé with almost zero on the day effort. Great for unexpected visitors or if you find you are out of food before the party winds down. But before Christmas why not try these for a mid week dinner. Serve with fried rice or a bowl of noddles and you are going to be a happy eater. I try to get 60 balls out of this mixture. I don’t always make it! I find that towards the end of the process my meatballs get a bit bigger. I keep thinking I might use a melon baller to try and get uniform shape and size. But I am never that organised (or that bothered 😉 ). Cut off the root and the very dark end of the spring onions. Then roughly chop them into 3-4 pieces each. Add them to the food processor along with the garlic. Slice or grate the ginger into the processor. Cut the ends off the chillies and add them to the processor. Blitz the mix until you have a roughly chopped mixture. Add the coriander, lime zest and salt. Blitz again until you have a finely chopped mixture. Add the chicken mince and whizz until combined. Fill a bowl with water and dip you hands in. Remove about a teaspoon of the mixture and shape into a small ball. 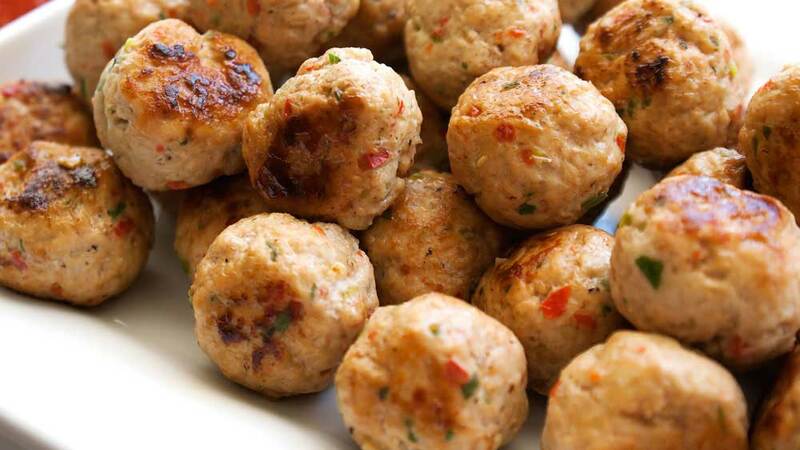 Once you have finished, heat the oil in a large frying pan and cook the meatballs in batches. Keep that pan on a medium high heat and cook them for 3-4 minutes, rolling them about the pan to cook on all sides and prevent them sticking or burning. After 3 minutes remove a ball and cut it open to check there is no pink. Remove and enjoy with a side of sweet chilli sauce. If serving these to paleo or gluten free friends please check your dipping sauce is appropriate. Can you re heat them? Or poach them in a pan of simmering stock/salted water (It should be salted as when you poach them they will leech out some salt, adding salt to the water helps to prevents this). You can also make them and then freeze them raw. I make them, freeze them on a baking sheet until solid, then transfer to a tupperware. TO cook, defrost in the fridge overnight and cook as normal.